PARIS -- Belgium's prime minister refused to accept the resignations of his justice and interior ministers Thursday despite increasing evidence of intelligence and law enforcement failures to prevent this week's suicide bombings by Islamic militants. 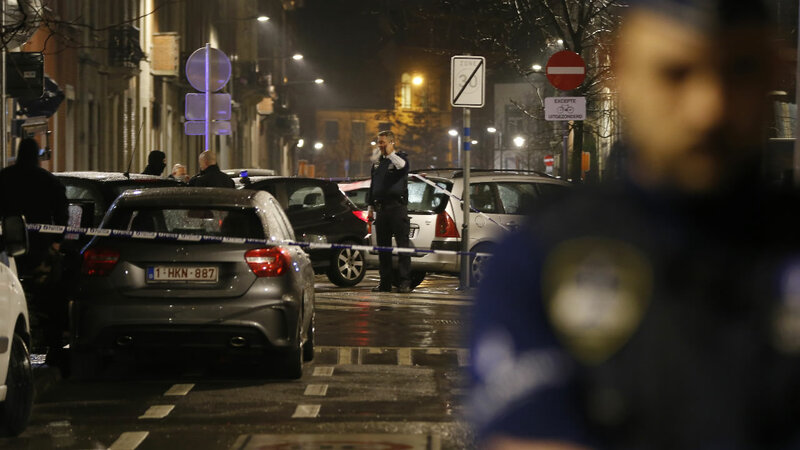 With at least one attacker at large and an unknown number of accomplices, police detained six people in raids around the Belgian capital Thursday night. In a Paris suburb, a man suspected of plotting an imminent attack was also detained Thursday, but the interior minister reported no apparent link with the Brussels airport and subway bombings or the Nov. 13 attacks on Paris. Authorities lowered Belgium's terror-threat level by one notch, although they said the situation remained grave and another attack is "likely and possible." Belgium had been on its highest alert ever since Tuesday's bombings in the Brussels airport and subway that killed 31 people and wounded 270. "We don't have to be proud about what happened," Justice Minister Koen Geens said of the government's failures to halt the attacks. "We perhaps did things we should not have done." Less than a mile from the bombed subway station, European justice and home ministers held an emergency meeting where they condemned the "terrorist acts" as "an attack on our open, democratic society." They also urged the European parliament to adopt an agreement allowing authorities to exchange airport passenger data. A manhunt continued for one of the Brussels airport attackers who was recorded on a surveillance video and had fled the scene. 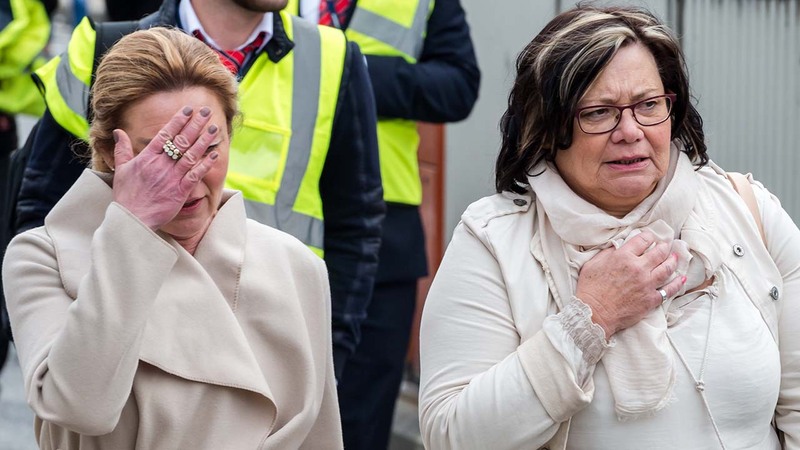 Belgian prosecutors said the raids Thursday night targeted central Brussels, Jette and the Schaerbeek neighborhood, where police earlier had found a huge stash of explosives and bomb-making material in an apartment used by the Brussels attackers. Prosecutors declined to comment on reports from Belgian state broadcaster RTBF and France's Le Monde and BFM television that a fifth attacker may also be at large: A man seen on surveillance cameras in the Brussels metro carrying a large bag alongside one of the suicide bombers. It is not clear whether that man was killed in the attack or is a fugitive. Authorities drew a line between the Brussels bombings and the Nov. 13 attacks that left 130 dead in Paris. Both appeared to have been carried out by the same Belgium-based Islamic State cell. Prosecutors have said at least four people were involved in the Brussels bloodshed, including brothers Ibrahim and Khalid El Bakraoui, identified as suicide bombers. European security officials identified another suicide bomber as Najim Laachraoui, a suspected bombmaker for the Paris attacks. Khalid El Bakraoui blew himself up on the train, while Ibrahim El Bakraoui and Laachraoui died in the airport. It is clear that some of the Brussels attackers had been on the run from authorities in France and Belgium but were still able to hide in safe houses, assemble bombs and carry out linked attacks. "If you put all things in a row, you can ask yourself major questions," about the government's performance, said Interior Minister Jan Jambon, who along with Geens had tendered his resignation. Notable among the questions were those raised by Turkey's announcement it had warned Belgium last year that one of the Brussels attackers, Ibrahim El Bakraoui, had been flagged as a "foreign terrorist fighter." But Prime Minister Charles Michel asked Jambon and Geens to stay on, given the current challenge the government is facing. Turkey said Wednesday that Ibrahim El Bakraoui was apprehended in June 2015 near Turkey's border with Syria and deported to the Netherlands. He was later set free by the Dutch for lack of proof of his involvement with jihadis. Geens appeared on a Belgian TV news show and was asked who was to blame for the failure to follow up on the Turkish warning. "It is clear it is not one single person, but it is true that we could have expected from Ankara or Istanbul a more diligent communication, we think, that perhaps could have avoided certain things." "Our own services should perhaps have been more critical about the place where the person had been detained," he added, referring to Turkey's border area with Syria. "When someone is arrested there in a city few people know, it is clear enough for insiders that it could be a terrorist," Geens said. "Here, though, he was not known as a terrorist. It is the only moment we could have linked him to it. And that moment, perhaps, we missed." The justice minister acknowledged that "we have to be very self-critical." But Geens added that "such events have also happened in nations with the best intelligence services in the world," pointing to the Sept. 11, 2001, attacks in the United States. Authorities had been unable to find Salah Abdeslam, one of the Paris ringleaders and described as one of Europe's most wanted men, until a breakthrough led them to a Brussels apartment where he was arrested Friday. The intelligence shortcomings have prompted European authorities to once again call for quicker and more efficient intelligence cooperation. Rob Wainwright, the head of Europe's police agency Europol, said his agency is trying to make sure investigators have access to needed information. "You have a fragmented intelligence picture but we're trying to help with that," he said. "Our databases contain thousands of names of suspected foreign fighters which have been submitted by member states, and even the United States. But we also have records on arms smuggling, money laundering, forgery and other elements which are particularly relevant given that many of these guys had petty crime backgrounds." He said the threat goes beyond France and Belgium and that it is impossible to reduce it to zero. "We are looking at large numbers of foreign fighters who have returned as potential terrorists," he said. "And we are faced with a strategic decision by the Islamic State to aggressively target Europe. These are all very challenging dimensions. As for how large the community is and who has been sent back - that is the golden question." The federal prosecutors' office said Khalid El Bakraoui had rented a house used as a hideout for the Paris attackers, and that he had been hunted by police since December. Also Thursday, Abdeslam was summoned to court in Brussels. His lawyer, who had initially vowed to fight extradition to France for the Paris attacks, said he now wants to be sent there as soon as possible. Abdeslam evaded police in two countries for four months before his capture, and the attackers in Brussels may have rushed their plot because they felt authorities closing in. Abdeslam's lawyer, Sven Mary, told reporters that Abdeslam "wants to explain himself in France, so it's a good thing." Mary said the extradition process should be completed by mid-April. While Belgium lowered its threat level, "the danger has not gone away," said Paul Van Tigchelt, the head of the terror assessment authority. Nevertheless, several hundred people gathered at a makeshift memorial to the victim in Brussels' central Place de La Bourse. They sang peace songs, took selfies and wiped away tears.